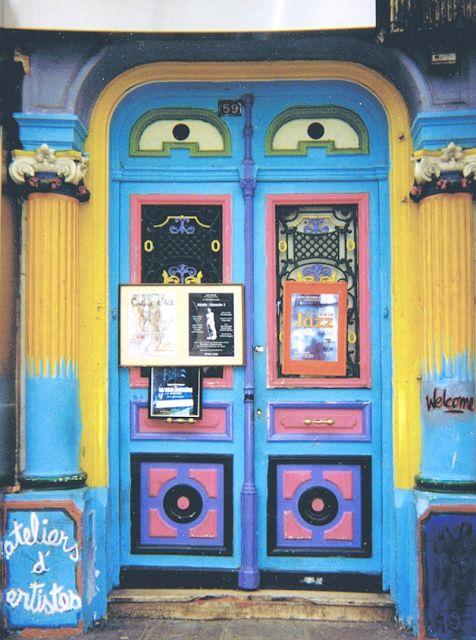 Here's a classical front door with a touch of colors! This is the entrance of an artists' studio. Visit other places at Jane's CV. I thought I could guess, now I know. crap. gorgeous door that it was. On dirait Londres, ou Amsterdam, ou San Francisco !!!! mais je lis ateliers d'artistes en français... alors, je donne ma langue au chat !! Je dirais Paris... mais, sans conviction ;) En tous les cas, c'est une chouette photo. hmmmmm. i don't know where, but maybe berkeley, CA? Hm... I have no idea. But it is stunning! Quelque part aux USA ? Pas très précis comme réponse mais bon en tout cas c'est une entrée que l'on remarque ! en France, très colorée cette porte!!!! l'entree des artistes...in pAris...en tout cas c'est pas a SF... ils savent pas faire les fermetures a baillonettes comme ca! wow that is the best door!! Now I have a few ideas. Oh wow! Have a great week! Et alors, et alors ? C'est où, c'est où ? I can imagine the space inside of the door! So inspirational. I didn't partake in this one...Next week. oh, I was totally wrong there, then. glad I was.